I kicked off my reading of the 2015 Hugo shortlist with the biggest but also potentially the most pleasurable job - the novels. See here for some thoughts on an overall approach in light of this year's controversy. I also hadn't realised - according to Wikipedia - that KJA has written more than 50 best-sellers. It's easy to be sniffy about writers who tend to work in already established universes, but you don't keep getting those gigs unless you are good at what you do. So, before I talk you through The Dark Between The Stars, it's hats off to an author doing very well for himself at the commercial end of the market. 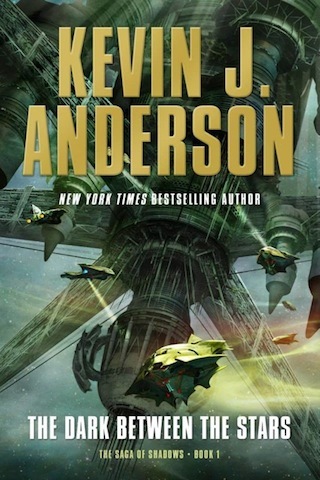 Dark is more of what Anderson does - space opera on an epic scale - only in a sandbox of his own devising to play in. And what an elaborate, detailed, techno-baroque sandbox it is too, taking in psychic empires, gas giant mining, insectoid robot, gestalt forests, plague collectors and colours from out of spaaaaaaaaaace. This world-bling - to borrow a phrase from China Mieville - is one of two main admirable qualities the novel has, the other being the plotting. Anderson juggles a huge cast and multiple plot-lines without breaking a sweat, like the hugely experienced pro he is. But I'm essentially praising Dark as a feat of literary engineering rather than as a novel. These are virtues of control rather than mastery. The array of characters I found unengaging and rather one-dimensional, the action curiously flat. And the sheer size of the book and number of stories spreads Anderson too thinly, so that no single thread truly breathes in its own right. And there's at least three or four decent pulp SF tales - any of which would be worth reading in their own right - stuck inside this cetacean novel. More's the pity. So to suggest, as its nomination implies, that Dark is one of the best five books in fantasy and SF over the past year, is rather silly. On its own terms - pure entertainment rather than any notion of literary merit - it's okay, but it still doesn't bear comparison with the other nominees. And when even the token brain-blending novel of ideas on the shortlist - Cixin Liu's The Three Body Problem - is considerably more fun to read, it's hard to see what's it claim on anyone's Hugo vote might be. KJA is an effective, successful writer - his record speaks for itself. His contributions to the genre deserve recognition in some form. Just not this way, or indeed with this book.